Canon has done a tremendous job historically in the entry-level area of the DSLR camera market with its well-known Rebel line of cameras. The digital Rebels have been around for many years, and they still remain popular. And the latest Rebel, the Canon EOS Rebel T6i DSLR continues in that vein. The T6i might not offer a vastly different look or a significant departure in terms of its feature list from what was offered in the Canon Rebel T5i, but it's a strong model with greatly increased resolution over its predecessor. 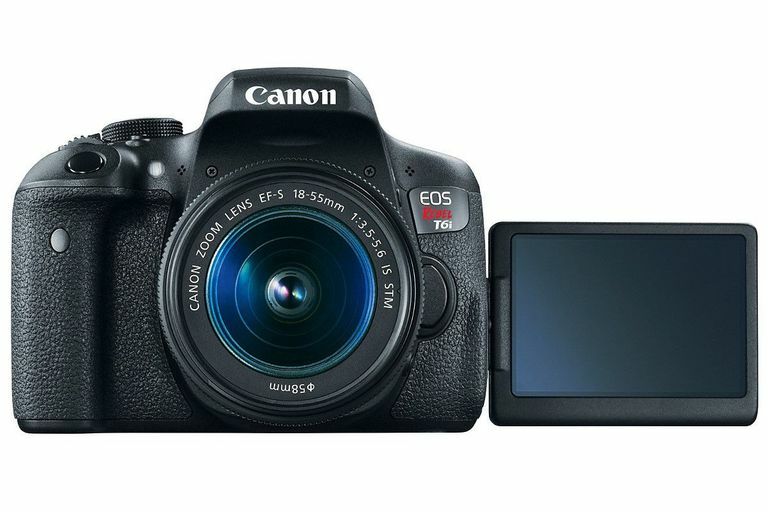 The Rebel T6i runs very quickly in Viewfinder mode, which is the best way to operate this entry-level DSLR model. However, when you need to shoot in Live View mode, you'll appreciate this model's articulated LCD screen. There's little chance of misidentifying the Canon Rebel T6i as an advanced DSLR camera. It just doesn't have the feature list or large-sized image sensor that would be found in a more advanced interchangeable lens camera. But against other cameras in its sub-$1,000 price point, it compares pretty well. The Canon Rebel EOS T6i DSLR camera has very good image quality, noticeably improved from the Rebel T5i. The improvement comes at least in part because the T6i has 24.2 megapixels of resolution, which is better than the T5i's 18 megapixels. It's handy that Canon provides the option to shoot in RAW, JPEG, or RAW + JPEG image formats with the Rebel T6i, giving this DSLR camera nice versatility. This model's low light performance is very strong, whether you're using the built-in flash or you're increasing the ISO setting. The APS-C image sensor plays a key role in the strong low-light performance of this camera. As with some DSLR cameras, the Canon T6i performs much faster in Viewfinder mode than in Live View mode. The Rebel T6i is a fast camera in Viewfinder mode, offering a top speed of 5 frames per second in burst mode. While Live View performance in the T6i is better than in past Rebel models, it's still a drag on the camera's overall performance. You'll want to work in Viewfinder mode the majority of the time. Autofocus speed with this model is very good, as Canon provided the EOS Rebel T6i 19 autofocus points versus nine AF points in its predecessor. That's still well behind what more advanced DSLR cameras provide, but it's a really nice improvement for the T6i over previous Rebel models. One of the biggest frustrations with the T6i is the fact that some of the buttons operate differently in Viewfinder mode than they do in Live View mode. If you're someone who will go back and forth between modes with this camera, you will quickly become confused with this quirk. Canon included wireless connectivity (both Wi-Fi and NFC) with the Rebel T6i, but it's not a particularly handy feature unless you want to transmit photos to a smartphone. It also drains the battery much more quickly than through typical usage patterns. Overall, the battery performance of this mode is below average. Otherwise, if you're familiar with other Canon Rebel DSLRs, you'll recognize the look of the T6i. But it's the performance improvements of this model that you can't see easily that will impress you and give you the incentive to upgrade from an older Rebel model.